Review date: 8 July 2000. "Value" CPUs have a lot going for them. Particularly when they're just as fast as their premium-priced brethren. The two major PC processor manufacturers, Intel and Advanced Micro Devices (AMD), want to maintain market segmentation. It has something to do with leveraging their dynamic paradigm synergistic mindshare, as I recall. "Serious" buyers are meant to pay the big bucks for the Pentium III and Athlon CPUs. Home and undemanding business users are meant to opt for the cheaper Celeron and new Duron processors, respectively. But if the cheap CPUs give you most of the grunt of the full-spec models, and are a lot less expensive, then, well, why buy anything else? Intel's Celeron has been stealing sales from the more expensive Pentiums for getting on for two years, now. And AMD's joining the party with the Duron, a high-performance low-cost CPU that is to the seriously fast Athlon pretty much as the Celerons are to the Pentium II and III. But to understand how this all hangs together, and what to go for in your next computer (or 173 pallets of new PCs for your 50-storey office, as the case may be) you'll need a quick modern history lesson. Pay attention, class; I'll be asking questions later. Intel made a lot of friends - though not as much money as it would have liked - when it first released its Celeron CPUs. 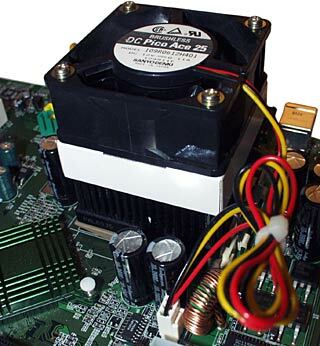 The original Celeron was, essentially, a cut-down Pentium II. The first two models, with the "Deschutes" core, were pretty much just P-II cores without the separate Level 2 (L2) cache chips. They had Level 1 cache, which was built into the CPU chip, but no L2 cache at all. The code-name for the product, in case you care, was "Covington". With no L2 cache, the Deschutes-based Covington Celerons lost out to similarly clocked P-IIs for many tasks, though they were pretty good for games. They sold well to overclockers - people that run their CPUs faster than stock. There was an excellent chance that the 266 and 300MHz Celerons would work fine with their Front Side Bus (FSB) wound up from 66MHz to 100MHz, without any core voltage boosting or alarming cooling or other fooling around. This made them into reliable 400 and 450MHz CPUs with a bargain price. Since the second hand price of these CPUs now closely approaches zero, they're still magnificent value for money, even though they were released in the positively antediluvian third quarter of 1998. After the two Deschutes Celerons came the new "Mendocino" core, with 128 kilobytes of full-speed L2 cache built into the CPU, not on separate chips as it is on Pentium IIs and earlier models of Pentium III. The separate-cache Intel CPUs have more L2 memory than Celerons, but they run it at half the core speed. The result of this is that for desktop tasks - business applications and games - the Mendocino Celerons run just as fast as an equivalently clocked Pentium II. The fastest P-IIs ever made ran at 450MHz, though, and couldn't be overclocked a great deal higher; the fastest Mendocino Celerons run at 533MHz, and give the roughly 18% faster performance you'd expect from that number. And you'll pay less than $AU250 for one, these days. The Mendocino Celerons are all pretty overclockable, too. The early sub-400MHz-stock-speed ones were pretty much all good for 400MHz if your motherboard could feed them an appropriate Front Side Bus, and easily four out of five of them were OK at 450MHz or faster. All Celerons run from a 66MHz FSB as standard (well, 66 and two thirds, actually), and use different, fixed multipliers to set their core speed. So a 300MHz stock speed Celeron has a 4.5X multiplier, a 400MHz one has a 6X multiplier, and so on. The faster Mendocino Celerons are already running close to the maximum speed their antiquated (by CPU standards...) core can handle, even if hopeful overclockers give them lots of cooling and an elevated supply voltage. So there's not a lot of point trying to overclock the faster-than-450MHz ones. Get a 300MHz Celeron up to 450MHz and you've got 50% more CPU power for free; winding a 500MHz Celeron up to 563MHz, on the other hand, is a much less exciting 12.5% improvement, which you probably won't even notice. The third incarnation of the Celeron is played by the late Jon Pertwee. No, wait a minute, I mean it's based on the Pentium III. Specifically, it's based the new single-chip "Coppermine" P-IIIs, which have full-speed on-die L2 cache, but less of it than their separate-cache "Katmai" predecessors. As with the Mendocino Celerons, the Coppermine P-IIIs don't lose out to the earlier models in performance, thanks to their faster cache; actually, because of design revisions and a higher density manufacturing process, the Coppermines are significantly faster at a given clock speed than the Katmai P-IIIs, consume less power, and emit less heat. Intel doesn't officially call the new P-III based Celerons anything special, but the core on which they're based is code-named the Coppermine 128. In common parlance, they're referred to as "Celeron 2s", and you can also tell what kind you've got by looking at the clock speed. If it's 566MHz or higher, it's a Coppermine 128 Celeron. If it's 500MHz or slower, it's an old-model one. If it's a plain "533" it's old model; if it's a "533A" it's Coppermine 128. The new Celerons also look quite different from the old ones; I go into this in more detail here. The Celeron 2s still run from a 66MHz Front Side Bus, though, and their smaller cache is somewhat less sophisticated in its design. So, at a given clock speed, a C-2's faster than a Mendocino-core Celeron or a Pentium II, but it's slower than a real P-III - Coppermine or Katmai. For desktop tasks, at the same clock speed, a Coppermine P-III will beat a Celeron 2 by something like 20%. The more cache-size and RAM-bandwidth limited a task is, the worse a Celeron 2 will look. For some tasks, like serious 3D rendering, the Celeron 2 will be only about two thirds the speed of a Coppermine P-III running from 100MHz FSB, and even worse compared with the higher-end 133MHz FSB Coppermines, after compensating for the core speed difference ("clock-for-clock"). Serious 3D rendering, though, isn't something a Celeron 2 is often called upon to do. If you're a 3D animator it'll matter to you, but for most users the only tasks that'll show up the Celeron 2's inadequacies are things like complex 3D games running in low resolutions, so the graphics card isn't the limiting factor. At the resolutions you're more likely to actually use, the difference is harder to see. Celeron 2s are quite overclockable; many of them can handle 100MHz or even higher FSB speeds, with a small core voltage boost, on a suitable motherboard. Predictably, some of their clock-for-clock speed deficit goes away when you give them a faster FSB, although the less sophisticated cache still means a real Coppermine P-III will edge them out. You can overclock Coppermine P-IIIs as well, of course, but you need a motherboard capable of substantially-higher-than-100MHz FSB speeds to do it. AMD's new Duron is a cut-down Athlon, just as the Celeron 2 is a cut-down P-III, but it's not as cut-down as the Celeron. For a start, it runs from the same super-fast processor bus. Athlons have a 100MHz FSB speed - that's how fast the motherboard chipset talks to other components on the board, including the RAM, by default. But that clock speed's doubled for CPU-to-chipset communication purposes, for a 200MHz processor bus. The Duron uses this same bus specification. It's bottlenecked by RAM speed, so a Duron doesn't actually get three times the real world data transfer bandwidth of a Celeron, but the extra speed certainly doesn't hurt. The Duron doesn't use the same connector as the old Athlons, though. 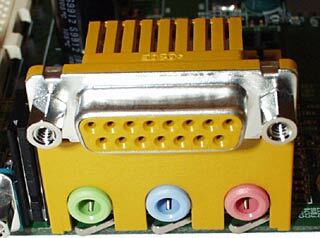 Old Athlons use "Slot A", a linear connector that's the same mechanically as Intel's Slot 1 but completely different electrically. Some newer Athlons use Slot A - I review one here - but the new "Thunderbird" core doesn't need separate cache chips, any more than do the Coppermine P-IIIs. So just as Intel are transitioning over to Socket 370, AMD are transitioning to their own Socket 462, with cheaper, simpler square processors. 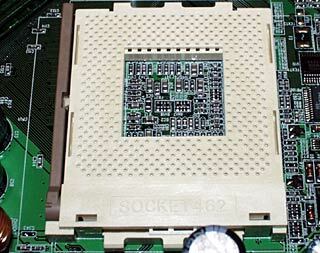 Socket 462, as the name suggests, has 92 more pins than Socket 370, but it's the same size and works the same basic way. And all Durons use this new connector. The Duron has more Level 1 cache than the Celeron, or any other current Intel CPU, for that matter - 64 kilobytes of instruction cache and another 64 kilobytes of data cache, versus only 16 kilobytes for each on the Intel side of the fence. The Duron's only got 64 kilobytes of L2 cache, though; the Celeron 2 has 128Kb. AMD like to spin this difference by adding the caches together, which is perfectly valid since L1 has more impact than L2. You get 192Kb of cache on a Duron, versus only 160Kb on a Celeron. There's 384 kilobytes of cache on the Thunderbird single-chip Athlons. They've got 256Kb of L2 cache, the same as the Coppermine P-IIIs, but arranged differently. The cache architecture of the Duron and Thunderbird is more efficient, in that it avoids duplication of data in both cache levels. This increases the overall cache effectiveness, and lets AMD start quoting even more impressive "useable on-die cache" figures. AMD are less likely to start loudly pointing out that the Thunderbird and Duron both have a 64 bit wide cache data path, versus the 256 bit wide path in the Coppermine chips. The AMD CPUs might have larger and better organised caches, but the Intel ones can move data into and out of theirs faster. All up, the combination of the powerful Athlon core with on-chip cache means that the Thunderbird is a Coppermine-beater, and the Duron is not far behind it. But to do anything with one of these new chips, you need a motherboard to suit it. Micro-Star International's K7T Pro, also known as the MS-6330, is one of the first Socket 462 motherboards available in Australia. It costs less than $AU275 including tax. And if you're after a perfectly OK, decently priced board for a straight-up-and-down business or home machine, it doesn't look like a bad choice. The board I got for review has an early production run box, which means it's called a "K7Z Pro", while current boards are called "K7T Pro". They're both MS-6330s, though. The name change parallels VIA's decision to rename the KZ133 chipset, the Socket 462 version of their popular KX133 Slot A chipset, to "KT133". They changed the name (trivia fans take note) because some people pointed out that "KZ" was and is the oft-used abbreviation for the German word "konzentrationslager" - concentration camp. Out of confusion, I'm going to call the board the MSI-6330 from now on, and avoid the whole issue. The 6330's got six PCI slots, and no old ISA slots. 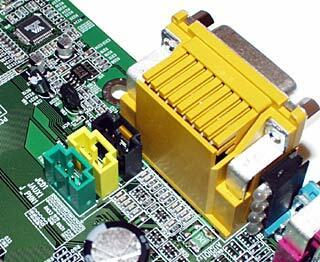 If you've still got ISA hardware, you upgrade it or you pick a different motherboard. Many motherboards these days have just a token one or two ISA slots, but many buyers never use them; it's nice to be able to fill a computer with current hardware if you need to. What's more interesting, though, is the stack of four little lights to the right of the audio/joystick connector block. They're there to replace cryptic error beeps. If you've a natural aptitude for Morse code, you may find the beep-codes that practically all motherboards use to indicate major problems quite comprehensible. There's a reasonable amount of standardisation across motherboards using BIOSes from the same manufacturer, but it can still be a pain to figure out what two short, one long, means for a particular board. The MS-6330 has a much more elegant system - these four inward-facing bi-colour LEDs. 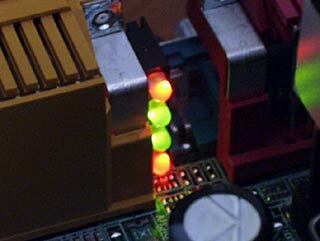 They illuminate in different patterns of red and green while the system starts up, and settle down to all green when the motherboard power-up process is complete. You still need the little cheat sheet that tells you what the codes mean, of course, but it's a straightforward way to communicate more data than most motherboards can manage via beep codes. You've got to be able to see the LEDs to tell what they're saying, of course. But major errors like no-RAM or where's-the-CPU don't generally crop up after a system's been built; you run into them when you've gotten something wrong while assembling the computer. The MS-6330 drive connectors are perfectly ordinary, except they're more "keyed" than most. They all have some unused pins removed, and matching pin-holes filled in on the motherboard ends of the supplied cables. As usual, you get one floppy drive and one hard drive cable with the motherboard - the hard drive cable is an 80 wire ATA/66-capable type. The keying stops you from accidentally plugging the cables in the wrong way around. But it also makes the included cables useless if you want to plug them into some other motherboard that doesn't have pin-keyed connectors. Drive cables are very inexpensive, of course, but if all you've got on the evening you want to get a computer working is a filled-pin cable that you can't plug in, it's still a pain. The on-board IDE controller supports transfer modes up to ATA/66 - hence the 80 wire cable that comes with the board. It works with ATA/33 and slower modes as well. The MS-6330's got all the other extras you expect from a motherboard these days, too. There's AGP 4X support, which is not very useful, since current systems are flat out feeding an AGP 2X card data, but doesn't hurt. 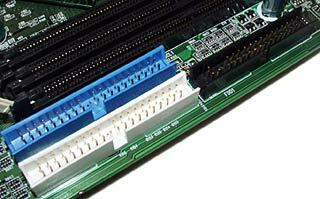 There's support for standard PC100 or PC133 DIMM RAM modules. The VIA chipset can run the RAM faster than the 100MHz FSB setting, and thus make use of the extra performance of the faster modules, but the real performance difference is likely to be slight, as RAM bandwidth has little impact on most desktop computer tasks. With three RAM slots - the usual number for consumer motherboards - you can install up to 1.5 gigabytes of memory. The 512 megabyte modules you need to achieve this feat are rather expensive per megabyte, though. Three rather more reasonably priced 128 megabyte modules will give you all the RAM you'll need for all but the most esoteric purposes. There's also a Communications Network Riser (CNR) slot, which is the newer and slightly more useful version of Intel's profoundly unexciting Audio Modem Riser (AMR) connector. You can plug not-terribly-good software-driven modems into the slot, but there are also cheap network adapters that can use it. Not that a plain network adapter is likely to break the bank, at a terrifying $AU35-or-so, retail. Bulk system assemblers might care about the saving; ordinary consumers probably wouldn't notice if they lost the price difference down the side of the couch. And you get the usual collection of ports, including an IrDA header and four USB ports, two on a rear panel card which, like the IrDA cable, you have to buy separately if you want to use them. The extra-USB-ports header is a standard type, and common enough now that some PC cases already come with a couple of front-mounted ports built in, and a connector cable to match. And you get FSB adjustment, too; one and two megahertz increments, selectable in the BIOS, from 100MHz to a somewhat implausible 120MHz. There's CPU voltage adjustment, too, but not a lot of it; more on overclocking later. There are only the two standard on-board fan connectors on the 6330, for speed-monitored three-pin fans such as most CPU coolers use. People who Must Have More Fans can, of course, run gizmoes like the one I reviewed recently here directly from normal power supply connectors. Setting up the MSI-6330's no harder than building a system with any other VIA-based board. There are some extra drivers you need to install if you're using Windows - they're included with the motherboard - and everything else is quite straightforward. Micro-Star include a good quality manual, with no severe Chinglish problems. The only oddity, which you're not too likely to encounter, is mounting a cooler on the CPU. The Durons don't use a terribly high amount of power, but they run warmer than the Coppermine 128 Celerons. CPU power consumption scales directly with heat output. Athlons, even the new single-chip Thunderbird ones, are substantially toastier than P-IIIs, but the Duron's lower transistor count and supply voltage give this 600MHz one less than 23 watts of peak heat output, and keep even the 700MHz version down to only 25.5 watts. So if you don't intend to overclock, pretty much any half-decent CPU cooler should be OK for a Duron system. CPUs can tolerate surprisingly high temperatures before your computer will start crashing - and they're very unlikely to actually be damaged by overheating. But it still doesn't hurt to take a bit of care. Step one in keeping your computer cool is to maintain good case airflow - the things inside your computer can't get any cooler than the air that's flowing over them, and the less air exchange the case manages, the hotter it'll be inside. Install a second cooling fan if your case supports it, and marshal the cable jungle that probably packs your PC box so that hapless air molecules don't have to find their way around 308 layers of folded ribbon cable on their way from inlet to exhaust. Step two is to use a good CPU cooler. Most Socket 370 CPU coolers will fit on Socket 462, but not all of them will. Case in point - the Thermaltake Golden Orb. It looks groovy, it's reasonably priced, it's got a nifty twist-lock clamping mechanism - but the couple I've got in my Pile Of Spare Stuff won't fit on Socket 462. Thermaltake's site here now has a separate listing for Socket 370 and Socket 462 Orbs, which suggests that they've addressed the problem. They use the same photo for each, though, so I don't know exactly what they've done. Socket 370 has one cooler-connecting hook on each end of the socket, and it's easy enough to clip any well-designed CPU cooler on. Many coolers are poorly designed, with strong clips that don't have much for the unfortunate installer to hold onto and require you to wince and sweat as you jam them onto the socket with a screwdriver. If your screwdriver slips and you gouge the motherboard - well, the board may still be handy as an emergency replacement roof tile. But connecting a Golden Orb or any of the other higher-quality coolers to Socket 370 isn't a big deal. Socket 462, though, has three hooks on each end of the socket. But they don't stick out as far. The number of hooks isn't a problem, since you can easily connect Socket 370 coolers to the middle hooks and ignore the others. But the original Golden Orb's locking mechanism doesn't properly fit the smaller clips; you can only engage one end of the Orb's clips. The Duron has four rubber standoff pads on it; they're there to keep CPU coolers designed for the much larger-topped Mendocino Celerons from teetering around on top of the small Duron CPU die. The Coppermine-based Intel processors have no such standoffs, and coolers made to suit them sometimes sport their own little pads to make up for this. But the round base of the Golden Orb isn't wide enough to contact the standoff pads on the Duron, so the cooler can wobble around while you try to wrestle the clips in place. Which could result in damage to the top of the Duron. Don't try it. 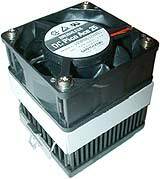 Pretty much any less avant-garde Socket 370 cooler, though, should be fine with the Duron; I dare say the newer model Orbs are fine, too. ...which is overkill, but which proves that at least some big fancy coolers made for Socket 370 CPUs do work with Socket 462. Here the big Japanese cooler ($US27.10 plus shipping from Alpha's on-line store here) is, mounted on the MSI-6330. The MSI motherboard has big fat smoothing capacitors around the CPU socket, which makes attaching a cooler a tad awkward, but it's not rocket science. As long as it's not either of my Golden Orbs. Realistically, practically any CPU cooler will do for a Duron in a reasonably well ventilated case. If you want to get the most out of whatever cooler you choose, all you need to do is scrape off the soft thermally conductive pad that many cheap coolers come with and replace it with a thin smear of thermal transfer compound - "heatsink grease". Use just enough grease to fill the tiny air gaps between the top of the CPU and the heatsink, and the Duron will have an easier time pumping energy into the cooler. 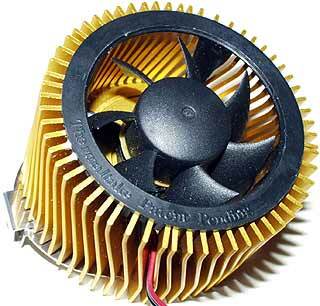 You'll get a hotter heatsink, but a cooler CPU. I've given up my bad habit of generating endless low-data-density comparative performance graphs. For those who just can't live without them, I highly recommend my handy-dandy all purpose Impressive Graph, right here. To cut through the fog of numbers - the Duron benchmarks pleasingly similarly to an identically clocked Athlon. When you consider that a 600MHz Athlon costs about 70% more than a 600MHz Duron, that's an impressive feat. For CPU integer speed and heavy-duty productivity applications, an Athlon beats a Duron by about 10%, clock-for-clock. In raw CPU bogo-benchmarks, which use small enough chunks of code that cache size isn't important, the Duron matches the Athlon practically exactly. But when there's more data being pumped around - in 3D games, say, which give CPU Floating Point Units a workout - the Athlon gives about 15% more grunt. The Thunderbird Athlons are quite a lot cheaper than the P-IIIs, which they outperform, clock-for-clock. And the Duron is quite a lot cheaper than the Celeron, and the Celeron is quite a bit slower than the P-III, but the Duron isn't very much slower than the Athlon, so if she weighs the same as a duck, she's a witch. Sorry. That didn't come out right. I mean, the Duron's a pretty obvious winner in the CPU stakes at the moment. Its performance edge over a similarly clocked Celeron is significant, but isn't going to knock your socks off. But compared with a similarly priced Celeron, it romps away. For comprehensive Duron benchmarks, check out the Sharky Extreme review here, Planet Hardware's 700MHz Duron-versus-Celeron shootout here, the Tom's Hardware Duron review here, and the AnandTech piece on the processor here. The MS-6330 is not a red-hot overclocking monster-board. Then again, most Athlon boards aren't. This is because the only way you can overclock just by twiddling motherboard settings on a Slot A board is by increasing the FSB, just as with Intel CPU boards. The doubled Athlon FSB speed makes most Slot A boards touchy little critters - they're close to the bus speed redline already and can't tolerate more than a few per cent FSB increase before the computer stops working, or at least becomes intolerably flaky. This doesn't stop the motherboard manufacturers from allowing you to set FSB speeds which, if they worked, would give you a processor so fast that it'd give you answers slightly before you asked the questions. But the über-speeds aren't actually useable. Socket 462 boards make things more interesting. They can change the processor multiplier. To change the multiplier of a Slot A Athlon, you have to crack open the case and attach a little circuit board to the "Golden Fingers" connector thus revealed. Or do some rather alarming soldering on your CPU circuit board. Socket 462, however, makes the Golden Fingers connections available straight off the standard processor, if a motherboard chooses to take advantage of them. Regrettably, the MS-6330 doesn't. The upcoming ASUS A7V and Abit KT7 Socket 462 boards, and no doubt various others, will let you tweak the multiplier as you like, but not this one. The 6330 lets you boost the CPU core voltage, but only by a maximum of 0.1V - from 1.5V to 1.6V, in this case. The Duron product codes allow for core voltages up to 1.8V. Presumably the higher voltages will be used by faster Durons; the 600, 650 and 700MHz Durons out so far are all 1.5 volt. Some pre-release sample Durons were apparently 1.65V units, with a higher current draw as well. This gave them nearly twice the peak thermal output of the shipping Durons, which are, as mentioned above, not a lot hotter than a Celeron. With this small voltage boost and some FSB twiddling, I found that the 6330 does about as well for overclocking as many earlier Athlon boards. You can wind the FSB up by about 10% and still have a stable machine, but it's hardly worth the effort. When you can fool with the multiplier, you can leave the FSB as it is and get your faster CPU speeds in a more elegant way. 650MHz certainly shouldn't be a problem, since it's doable by increasing the FSB. And 700MHz or more wouldn't surprise me, perhaps with a bit more core voltage and a hefty cooler. Turning a 600MHz Duron into a 700MHz or even 800MHz one would be a much more worthwhile increase. Bought with a CPU cooler, the retail, inc-tax prices of the 600, 650 and 700MHz Durons are about $AU215, $AU260 and $AU354, respectively. Ignoring the not-too-exciting overclocking possibilities offered by the MS-6330, the 700MHz Duron's only good for 17% more speed than the 600MHz, despite costing 65% more. And that 17% difference will only manifest itself fully in tasks that are completely CPU limited; in the real world it's likely that the overall speed difference between otherwise identical 600MHz and a 700MHz Duron machines will be lower than 10%, which is canonically the figure below which performance differences aren't noticeable. So the slowest model of baby Athlon's an obvious bang-per-buck winner. Especially compared with the Celeron, which'll cost you $AU250 or so even for an old 533MHz Mendocino-core unit. But this only applies if you're buying a new computer, or committed to buying a new motherboard. Since you practically certainly don't have a Socket A motherboard at the moment, you've got to factor that price into the equation. 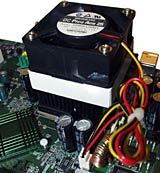 You can run a Celeron on practically any motherboard that can handle a Pentium II. You just use a "slotket" adaptor board, which costs about $AU25 and may even be bundled in with the CPU. There is as yet no such thing as a Slot A/Socket A slotket, to let you use Durons or Socket A "Thunderbird" Athlons on older Athlon motherboards. There may never be one that works reliably. The MS-6330 motherboard will cost you about $AU275 - a bit more than a plain Celeron-capable board, but on par for audio-included motherboards. Even when you include the motherboard price, though, the Duron doesn't look too shabby. Less than $AU500 for motherboard and CPU, for a 600MHz system that's comfortably the equal of a 700MHz, or even faster, Celeron. Now, you can't even get 700MHz Celerons in Australia yet. When they arrive, they're likely to retail for something like $AU400. Certainly more than $AU300. By then, the Duron option may be even cheaper, and you'll probably be able to get multiplier-adjusting Duron motherboards locally too. Availability's another confounding issue. Coppermine-based Intel CPUs are legendarily hard to find, particularly here in backwards little Australia. Major system builders can get reasonable supplies of them - well, at least the slower ones - but Intel can't make enough to fill total demand and so the retail market ends up being starved. If you decide a Celeron 2's the CPU for you, you may find yourself waiting a while for the dealer to get stock. Retail Duron supplies ought to be better, if the P-III and Athlon situation is anything to go by. You're probably not actually going to buy a genuine retail-boxed Duron, but will instead get a boxless Original Equipment Manufacturer (OEM) one. It's the exact same CPU, though; all it lacks is a shiny box, a factory heatsink and an installation manual. Most computer buyers, though, are no more interested in new CPUs, especially ones that need a whole new motherboard, than most car buyers are in purchasing a separate engine. A lot more Durons are going to be sold in built systems. But whether your tastes run to do-it-yourself or buy-it-built, the Duron's combination of power and price mean it's a clear winner for the budget-conscious home or business PC performance-hunter. Highly recommended. The Duron's out of date these days, of course, but readers from Australia or New Zealand can still purchase modern CPUs and motherboards of all kinds from Aus PC Market.